Note: The Router will set itself up with a static IP address http://192.168.1.1) and will act as a DHCP server (Make sure your network card it set to get its address automatically. Warning: Make sure you have all your Routers settings, before you start, especially your ADSL username and password (ring your ISP and confirm) before resetting the Router as all these settings will be WIPED! 2. Use a pen, to depress the factory reset button on the rear of the device. 3. The power light will blink rapidly. 4. Release the factory reset button. If you can log in but just want to wipe the settings, and revert to factory defaults. 1. 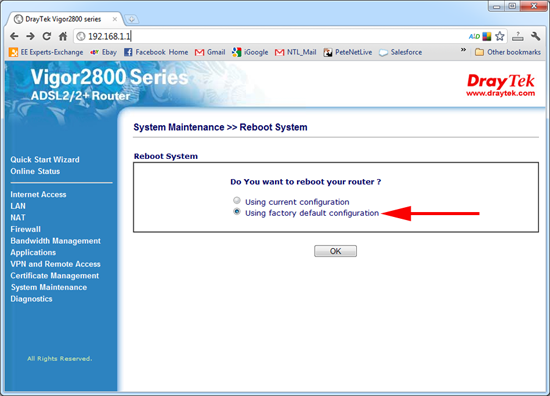 Connect to the web management console and navigate to, System Maintenance > Reboot system > Tick “Using factory default configuration”. 1. 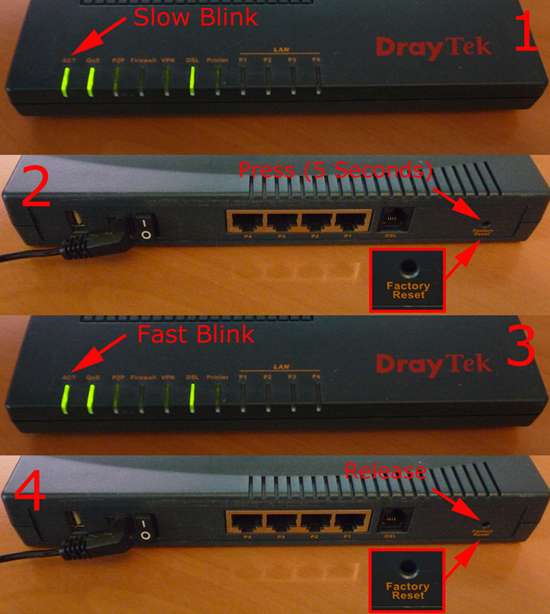 Familiarise yourself with the DrayTek Vigor firmware upgrade procedure. But use the firmware that ends in .RST NOT the firmware that ends in .ALL. (Note: The .all firmware just updates the firmware but keeps the settings).